of the bishop’s address to the 2010 diocesan synod. Our Synod theme is “Making Paths in the Desert.” In the desert one has to be able to see with greater clarity in order to discern the sometimes subtle but rigorous signs of life. Here are some places where I see God providing life. Fifteen months ago, we were struggling with the prospect of a financial deficit as large as $70,000 by year end. Through sacrificial gifts from individuals, from parishes over and above their earlier commitments, an improvement in the world markets and careful managing of our expenses, we actually ended the year with a small surplus. The Mapleton Lane life-lease project of St Clement’s Parish on the edge of Selkirk is an example of a small parish that God stirred with a large vision. As a result, there now stands a beautiful multi-storey building of apartments that actually dwarfs the historic stone church in which this worshipping community heard and responded to God’s call. The little community of saint benedict’s table started as a kind of experiment in trying to dig deep into the treasure of our ancient tradition and express it in ways that speak to the 21st century and into our future. It is now the worshipping home of a couple of hundred members – of all ages – and most encouragingly of lots of people in their twenties and thirties. 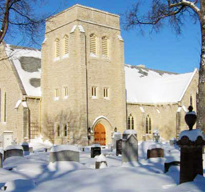 The transformation of St Matthew’s, Winnipeg is a story of new birth emerging by letting go of an old body – in this case its glorious traditional building. Most of the building will be re-designed and given over to housing for the community. The emphasis on community ministries is continuing as is the small but essential worshipping, ministering community we know as St Matthew’s. It is another sign of God’s life springing forth in the desert. In the middle section of Isaiah, the author speaks on several occasions of One who is sent from God who, through his service, will save Israel. Matthew, in his Gospel, makes the connection between Jesus and this Servant of God and, quoting Isaiah, says of Jesus, “He will not break a bruised reed or quench a smouldering wick until he brings justice to victory” (Matthew 12:20). I want to highlight some of the fragile organisms in our midst – so that we are careful to give them the nurture and care they urgently need. The first of these is our ministry with, by, and for the youth in our midst. A few dedicated disciples continue to nurture this ministry in the diocesan sphere, a few parishes give intentional support and energy to this ministry. It is not that this tender “reed” needs to be soaked in financial resources that we don’t have. It needs our attention. One of these “smouldering wicks” is our ministry with, for, and to aboriginal persons. The needs which the Rupert’s Land Aboriginal Circle (RLAC) and its sister arm, Wechetowin, are trying to address will always vastly outstrip the resources that seem to be readily available. Even so, this “smouldering wick” needs each of our “little lights.” The important step that we need to take on this path in the desert, is to search out our own thoughts and feelings about these first Canadians (whether we’re aboriginal or non-aboriginal), take the time to learn about and share the truth of our common story – both the dark and bright parts, (and there are bright parts) and to realize that God is calling us to make a common path that helps us to accept our differences as a gift that enriches, rather than a problem that threatens. Another of these “smouldering wicks” is the Faculty of Theology of St John’s College at the University of Manitoba. You may not realize that St John’s College was created by and for the Diocese of Rupert’s Land – for both theological education and higher learning in the classical disciplines. For a variety of reasons, the life of this “smouldering wick” is now precarious. A year and a half ago, the Executive Committee began to respond, at least with intent, by passing this resolution: “The Diocese of Rupert’s Land believes that the presence of a local Anglican theological education and formation resource is absolutely critical to the long-term viability of ministry in the Diocese of Rupert’s Land. The Faculty of Theology of St John’s College is understood by the Diocese to be the primary provider of this education.” It may be that the kind of specifically Anglican theological education we will need from St John’s will look different in order to meet our present and future needs. During this past year, in response to at least a couple of diocesan Synods, the Way Forward, and numerous requests by parishes and individuals, we put in place a plan to look objectively at ourselves – to take stock of ourselves as parishes. Trying to include the best of other dioceses’ experience, and to avoid the pitfalls, we embraced Phase One of the Vitality and Viability study. The feedback from Phase One has just been shared with the parishes. In this context, it might be thought of as a “snap shot” – an initial look at each parish’s path in this desert in which we live. The goal is to help each path move toward greater vitality and viability. Phase Two and its Team are presently being put in place. Its purpose will be to walk with parishes as they integrate the feedback of Phase One into their path and discern how God is calling them to greater vitality and viability. When the General Synod of our Anglican Church of Canada was wrestling with the same question, it turned to the five Marks of Mission which are common to the whole Anglican Communion. We’ve re-oriented ourselves to the fact that God is the one who has the mission, and that God has called us together as Church in order to participate in that mission. We are confident that when we are engaged in the Marks of Mission, we are truly engaged in God’s mission. These are the marks that should guide and govern our conversations about vitality and viability. How can we be structured and resourced in a way that enables every Anglican to participate in meaningful and life-giving ways in these five marks? These are the marks that should guide and govern our Common Ministry and Mission and the Diocesan structures that support it. Phase One of the Vitality and Viability study asked, “Should the structures and processes of the governance and leadership of the Diocese of Rupert’s Land undergo an assessment of Vitality and Viability?” The overwhelming response was “yes.” I was actually part of framing that question and I think it follows naturally in the work we are doing. The structures and processes of governance and leadership need to be as vital and viable as possible in supporting the parishes and membership to engage in the Five Marks of Mission.